WELCOME TO THE ONLINE GUIDE TO WEST VIRGINIA'S WASHINGTON HERITAGE TRAIL. 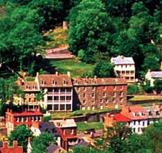 Use this site to discover and explore the natural and cultural history of 18th century towns, 19th century industrial sites, Washington family homes, springs, rivers and mountain ranges located along 136 miles of the scenic Eastern Panhandle of West Virginia. This guide is laid out by county, highlighting the five towns and leads you in detail to each of the more than 40 official sites. Click on a county to the left for a full list of towns and sites. 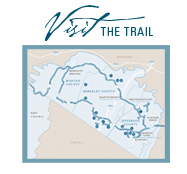 Click 'Visit the Trail' to download a PDF map of the trail. 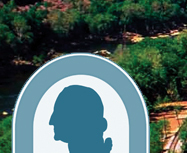 To read more about the history of the trail, click here.